- Stalemate in wage negotiation. UFBU decided to go on strike on 12th June and 2 Days in July. - UFBU will meet at 4 pm on 10th May. 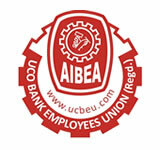 - AIBEA has taken up with the Chief Election Commissioner to debar Bank Loan Defaulters from contesting in the Elections.